That’s the new title! I handed in the second draft of the book yesterday, and the publisher and I and a dozen cast and crew that I asked all agreed it’s the best title. Current estimated publishing date is September 1, 2017. In celebration, Julia and I are taking a short vacation back in Tennessee, where the co-writers of much of the series live. Mark and Michael Edens wrote “The Phoenix Saga” five-part episode with me, so it’s only right that we have Phoenix, below, helping us celebrate. There’s a little known fact: we were going to change the X-MEN:TAS team. We had written the script where four members left and four new ones came on. It seems hard to imagine now. One of the strengths of the series is that we had found an excellent balance of diverse characters. How would we write stories without four of our team, mixing in four new-comers? The trick is that we were not planning to. Fox Network had decided to end the series at 65 episodes with a big story that concluded with four members leaving and four, who had proved themselves within the story, replacing them. The big four-part story was “Beyond Good and Evil,” and we had finished the four scripts — story laid out by Mark Edens and Michael Edens — with heartfelt farewells included. Then word came down that Fox didn’t want to end the series after all. They wanted another season (season five). Oops. Now I had to go back into “B. G. & E.” and take out all of the story bits that lead to four characters leaving and four new ones stepping in. Not pleasant. What was a really well-constructed 88-minute story now needed to be patched together to be something different. Fast. Oh, well. 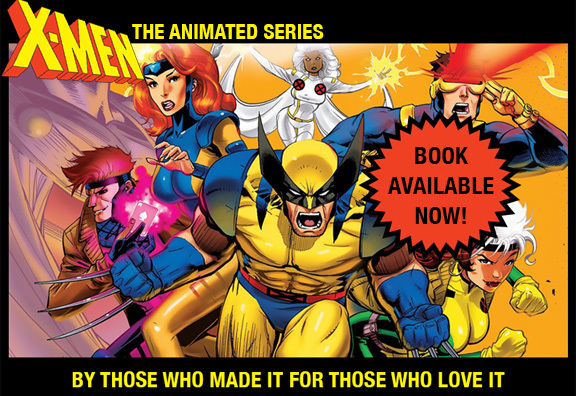 Below are our original ten X-Men (including Morph), plus some guest stars. See if you can guess which four of our ten was set to leave and who would have replaced them. Two of the replacements are among those shown below. WHO LEFT AND WHO REPLACED THEM? Names matter. For Romeo and Juliet, their surnames meant they were screwed. For those of us on X-MEN:TAS who were trying to adapt a massive universe of preexisting characters, it was a challenge. How do you feature a character whose name grates on you or seems inappropriate? Some characters just sound wrong to your ear. It could be that you grew up knowing three idiots all named Fred. It could be a favorite movie character whose name you never wanted to sully (“Start the ball, Tector…”). Marvel comics creators were world-class at coming up with evocative names for their seemingly endless universe of characters, but “Strong Guy?” (Head writer Mark Edens hated that one.) I had an aversion to a character we never used because, to my ear, it just sounded goofy. It was the dragon Fin Fang Foom (see below). The fierce creature you see here would look great in animation. But I couldn’t imagine our characters saying his name out loud with a straight face. Oh, well, there were plenty of others. Which brings me around to a name almost as goofy as the fictional “Foom,” but which was absolutely real. Today, King Bhumibol of Thailand died (see lower image). He had been king for SEVENTY YEARS. My late father used to tell my sister Karen and me bedtime stories 50 years ago, some of which starred a mysterious character from the Orient named “King Bhumibol.” To our young ears, the name sounded like “BOOMY-BALL,” and its sound delighted us. We both assumed he had made such a fantastical name up; later, as adults, we discovered to our surprise that our strangely-named, legendary king was very real. But that wasn’t the point. In the fairy tales our dad told us, in his gentle voice, the name sounded right. King Boomy-ball fit. Today, as His Majesty passes, I thank him for that.